…China’s Li Xuerui (pictured above, in the middle) tied Lee Chong Wei of Malaysia for the most Superseries singles titles, with 4? …Lin Dan won only one Superseries and two Grand Prix Gold tournaments but along with his Asian Games and Badminton Asia Championship titles he had more major singles titles than anyone else on the year? …the most successful Grand Prix winners were Zhang Beiwen from USA and Japan’s Nozumi Okuhara (pictured right), and Max Schwenger and Carla Nelte of Germany with 3 successes each? Zhang also had one Grand Prix Gold title, however. …Chinese players won 33 Superseries titles out of the 65 at stake (12 Superseries + Superseries Finals), which means China won more than 50% of all Superseries titles? …China’s Zhao Yunlei was the most successful player with 8 Superseries titles and over US$246,000 in prize money? …Zhao Yunlei and Zhang Nan (pictured left) of China were the only players to win titles at both the World Championships and the Superseries Finals (as well as the Asian Games)? 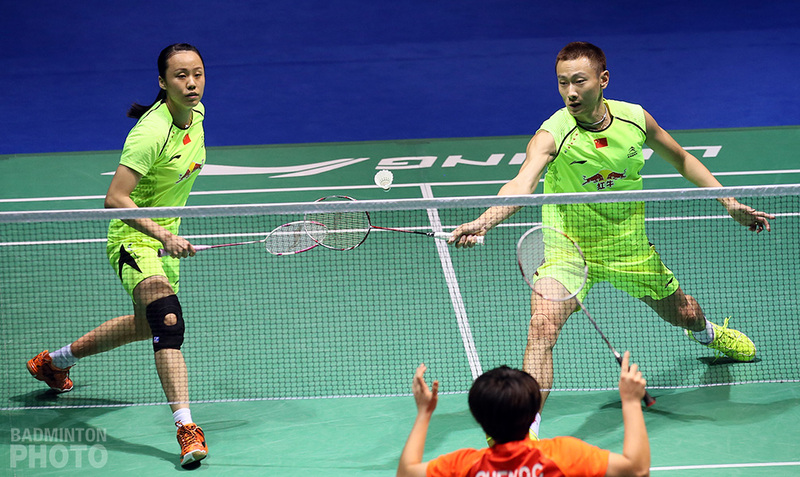 …Zhao Yunlei and Zhang Nan were also the only players to win Superseries titles in two disciplines? …Japan, in spite of their amazing runs in team events, won only two Superseries titles (including the BWF World Superseries Finals), both courtesy of Misaki Matsutomo and Ayaka Takahashi? 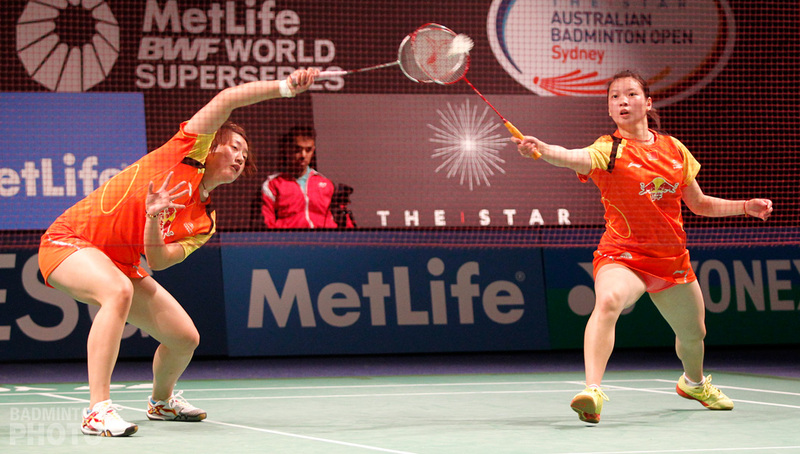 …the total prize money in the BWF World Superseries circuit was close to US$7 million? …India’s Kidambi Srikanth and Chinese Taipei’s Chou Tien Chen (pictured) were both the first ever men’s singles players from their respective countries to win a Superseries title? 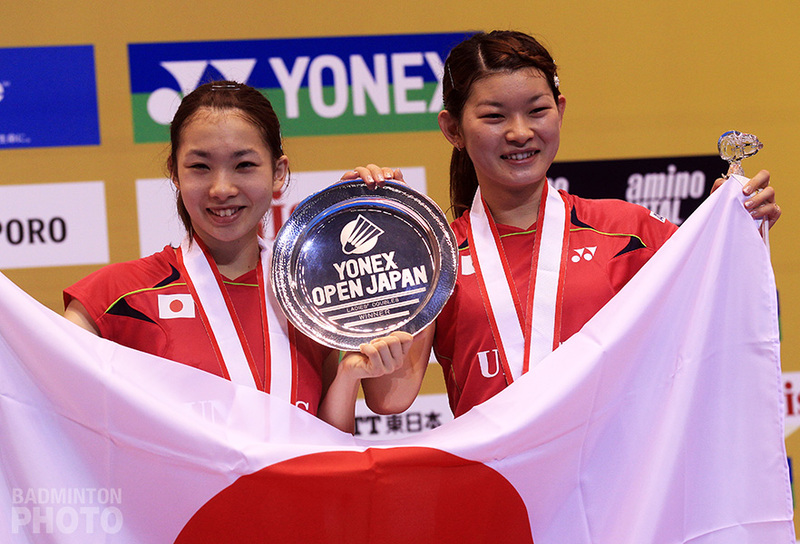 …eight players won Superseries titles for the first time in their careers? They were Misaki Matsutomo and Ayaka Takahashi of Japan, Tang Yuanting and Lu Kai of China, Kidambi Srikanth of India, Chou Tien Chen of Chinese Taipei, and Goh V. Shem and Lim Khim Wah of Malaysia. …both the oldest winner of a major title, Tang He Tian (AUS, New Zealand Open Grand Prix), and the youngest winner Chen Qingchen (CHN, India and Bitburger Grand Prix Golds), were born in China over 20 years apart? 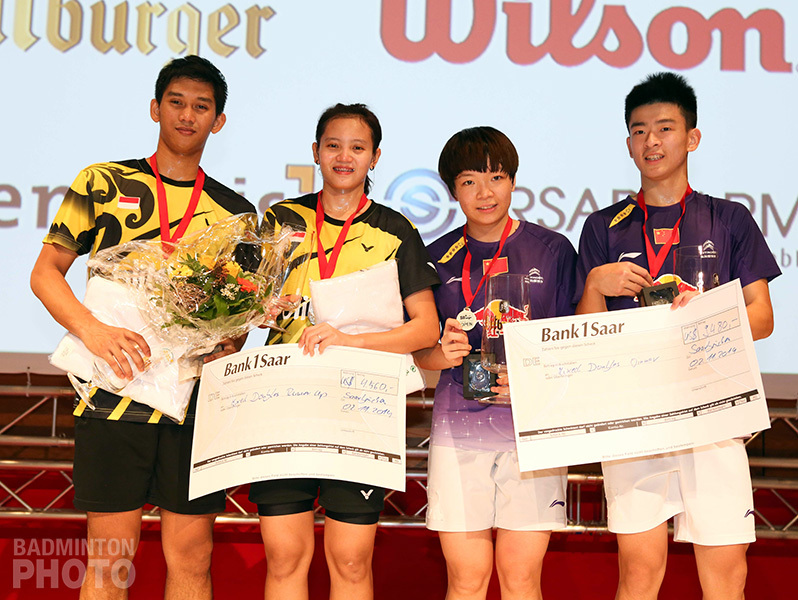 …ten former World Junior Champions – Liu Cheng (CHN, 2010), Viktor Axelsen (DEN, 2010), Lee So Hee and Shin Seung Chan (KOR, 2011-12), Alfian Eko Prasetya (pictured, far left) and Gloria Emanuelle Widjaja (INA, 2011), Edi Subaktiar (INA, 2012), and Chen Qingchen (pictured, second from right), Li Junhui, and Liu Yuchen, (CHN, 2013) – won their first major titles? …15 of the year’s 65 Superseries titles were won by defending champions (including Bao Yixin winning in Malaysia with a different partner)? Only the Australian Open, Hong Kong Open and Superseries Finals had no repeat winners. …China’s Yu Xiaohan and Huang Yaqiong (pictured right), in the year they turned 20, each won four Grand Prix Gold titles with three different partners? Yu won women’s doubles with both Huang and Ou Dongni, and mixed with Liu Yuchen, while Huang won women’s doubles with Yu and mixed with both Lu Kai and Wang Yilu. …Zhao Yunlei was the only player who scored a doubles double at a Superseries tournament? In addition to winning both the women’s and mixed titles at the Hong Kong Open, she also did it at the World Championships. Huang Yaqiong and Vita Marissa both did it at Grand Prix Gold events and in Grand Prix events, Shin Seung Chan did it and Max Schwenger and Carla Nelte pulled off a doubles tripod at the Brazil Open, winning mixed together and level doubles separately. …only five Superseries titles were won by shuttlers playing on home court? They were Lee Chong Wei and Goh V. Shem / Lim Khim Wah in Malaysia, Misaki Matsutomo / Ayaka Takahashi (pictured bottom) in Japan, and Wang Xiaoli / Yu Yang and Zhang Nan / Zhao Yunlei in China. Does it right? If I say that Indonesia’s Tontowi Ahmad/Liliyana Natsir is the first Mixed Double pair in badminton history who won All England SSP consecutively 3-times and made hat-trick in 2014. They give Indonesia another record in All England after Rudy Hartono with his 8 titles (7 consecutive titles). I’m not sure there is much of a record there. Perhaps one could say that Ahmad/Natsir are the only ones to win three consecutive All England titles in the Superseries era. They are not the first to do it in All England history, though. A few other pairs have won 3 straight mixed titles. The most recent was Park/Chung of Korea, who did it 1989-1991 but that wasn’t a record because Hume/Uber had won four in a row from 1933-36. I believe Ahmad/Natsir are the first to win 3 consecutive SS XD titles but they did that first in India. They are certainly not the first to do it in any discipline, though, as Lee Chong Wei had done it long before in MS at the Malaysia Open and Jung/Lee in MD at the China Open. Still, their streak is still alive so who knows what they can accomplish? Wang Shixian won only 3 super series, All England, India & French. Thank you for pointing that out. The article has been corrected.